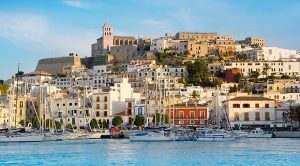 Ibiza is the original and still one of the best party travel destinations in the world, and if you’re thinking of where to go for your lads’ holiday or girls’ trip for summer 2019- here are 5 reasons to make it Ibiza! 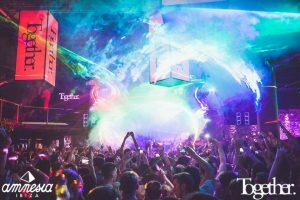 The stuff of legends, the white isle is home to some of the biggest superclubs on the planet like Amnesia, Sankeys and Eden. The clubs here are so good that we weren’t surprised to see Tropical Wonderland at Eden pick up the prize for the Best Club Night in our 2018 awards, voted for by our guests! And your summer 2019 party holiday promises to be even bigger and better thanks to our awesome event packages! Take one super-boat, add the island’s biggest DJs, and you’re ready to set sail on the Pukka Up Boat Party. Party hard and then watch the panoramic sunset views! The Pukka Up Boat Party in the middle of the Mediterranean Sea is where you’ll experience one of the best parties of your life. Roll on your 2019 Ibiza party holiday! There are pool parties, and then there’s the Ibiza Rocks Pool Party! 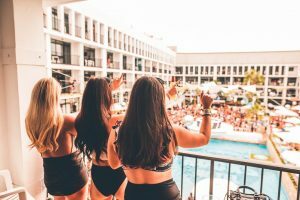 Ibiza Rocks was epic in 2018 with a brand new 360 degree poolside performance area, raised VIP terrace and residencies from Craig David, Rudimental, Lovely Laura and Cuckooland. And for your 2019 Ibiza clubbing holiday, daytime will be all about Ibiza Rocks. 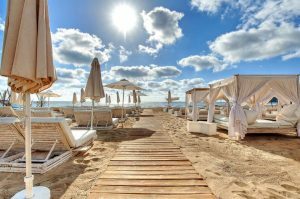 The longest stretch of beach in Ibiza can be found right here at Playa D’en Bossa. Bag a Bali bed in one of the many beach clubs and let the chilled daytime sounds of Ibiza float over you. Then you can roll into nearby Sankeys. Just another reason to book your Ibiza party holiday for 2019 with Party Hard Travel now!